Geometric blanket and throw in vibrant and pastel colours. Hand-woven in 100% natural Turkish cotton. Geometric blanket and throw with an iconic diamond pattern. Super soft to touch, the quality and pattern of this blanket make it one of the Luks Linen best-sellers. The vibrant Damla geometric blanket design instantly uplifts your bathroom, living room or baby room, with its range of bright and pastel colours that invite sunshine into your home. The large blanket size (King size) makes it an ideal as a colourful bedspread or picnic blanket. This sumptuous geometric blanket is made from 100% natural and ethical Turkish cotton. Damla is one of the most lightweight weaves, making it absorbent and quick drying, so pack it in a bag ready for your next adventure. Each piece has been hand-woven by Turkish master weavers using the softest cotton and a hand knotted fringe, ready to wrap around a loved one any time of year. True to its commitment to sustainability, this product comes with a 20-year guarantee. You can see all the Lüks Linen blankets, throws and peshtemals here. Note: Luks Linen are enjoying an Easter break 19-22nd April, so orders will be sent upon their return. We recommend you wash Luks Linen products before use to relax the fabric and release the natural starch that is in the cotton. Products are normally dispatched within maximum 3-5 working days if in stock. Once dispatched, products are normally delivered in 2-3 working days. If something is marked out of stock, please contact shop@chalkandmoss.com to reserve it. We’re happy to arrange international shipping upon request. Please contact shop@chalkandmoss.com for shipping costs. Your order will be sent directly by Luks Linen (who receives your name and address), as instructed by Chalk & Moss. Standard Chalk & Moss returns policy applies. Lüks Linen is an independent soft furnishings lifestyle brand, founded in 2015 by former design and advertising director Rachel Ward. 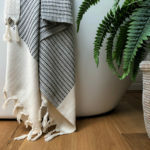 With a strong ethos supporting ethical and sustainable production in small batches, Lüks Linen works with artisans in Turkey to produce exquisite and homely blankets, throws, cushions, towels and peshtemals (also known as Hammams). The comforting natural materials and colours in the Lüks Linen range suits biophilic, nature connected interiors. Made by master weavers from family run businesses, drawing on centuries of craftsmanship, these textiles are hand loomed in Denizli and Hatay using locally grown cotton and wool. The products are all OEKO TEX certified, meaning no harmful chemicals are used in their production. Their next aim is to be a fully certified organic brand. Lüks Linen works with young designers and artists, who promote the use of GOTS accredited cotton. The timeless design and long lasting quality helps dissolve the tendency for a seasonal, mass-produced and throwaway culture. The longevity is clear from their 20-year guarantee. It’s time to look again towards the handmade, natural and well crafted. Understand where the products you buy come from, and let their story become the fabric of your own story.